“To Kill A Mockingbird” On Broadway: I Wish All The Drama Weren’t Happening Offstage! The Times reports: ‘A prominent Broadway producer has offered to stage a single performance of Aaron Sorkin’s theatrical adaptation of “To Kill a Mockingbird” inside a federal courthouse in an effort to prove that the play is faithful to the novel. 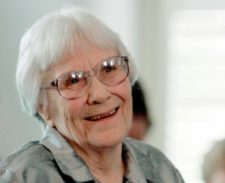 The producer, Scott Rudin, made the proposal on Monday as part of a blistering federal lawsuit he filed in Manhattan, in which he demanded $10 million from novelist Harper Lee’s estate for challenging Mr. Sorkin’s adaptation. Mr. Rudin threatened to cancel the much-anticipated Broadway production of the play, starring Jeff Daniels as Atticus Finch, which has been scheduled to open in December under the direction of the Tony winner Bartlett Sher. Mr. Rudin said the efforts by the estate to assert control over the script had already damaged the process, making it difficult to secure the money needed to finance the production. “Investors are not willing to invest millions of dollars when a cloud exists,” the lawsuit said.